Gatlinburg Pet Friendly Cabins - Welcome to our dog friendly Lacey's Place where the quiet, peaceful setting will entice you to relax and enjoy all that the Smoky Mountains has to offer. Our luxury log cabin is conveniently located between Gatlinburg and Pigeon Forge (less than two miles off the parkway) on paved, well-maintained two-lane roads. The gentle drive to our authentic log cabin will be easy on your nerves as well as your vehicle. Situated on a beautiful lot with plenty of trees, a large yard, and open space, Lacey's Place is high enough in the mountains to offer a spectacular view of the Smoky Mountains. Cable TV, with local channels, high definition channels, and premium channels is provided on all three TVs. Each TV has a Digital Video Recorder so you can record your favorite shows while out and about and watch them at your leisure. Wireless high-speed internet service (5.0), WiFi, is available so you can keep in touch, as well as unlimited local and long distance calling from the cabin phone. PET FRIENDLY: Well-behaved house-trained dogs, under 25 pounds are welcome with owner approval. Larger pets will be considered, just ask. We have a pet fee of $75.00 per pet, per stay. MASTER BEDROOM: This bedroom is on the main level and has a KING size bed with a premium top-of-the-line pillow top mattress. French doors opening to the porch provide easy access to the private outdoor hot tub. Adjoining this bedroom is a recently remodeled and updated bathroom with a 5 foot walk-in shower featuring a panel shower system, including a rain-fall shower head, 8 massage/stream jets, and a multi-functional hand shower. This combination is great for guests who prefer one-level living. LOFT BEDROOM: The second bedroom is located in the open, spacious and romantic upstairs loft. It too, has a KING size bed with a premium top-of-the-line pillow top mattress. You can enjoy waking up in the morning to the sun filtering through the vaulted ceiling side lights as you appreciate the tree top view. Enjoy a romantic bath in the jetted garden tub, or spend some time in the sitting area, reading one of the many books available from our library. A PlayStation 2, with a variety of family-friendly games is available on the 27-inch plasma TV in the loft area. There is a half bath adjoining this bedroom. DEN: The den has a QUEEN size sleeper sofa with a 5' thick mattress along with two rocker recliners. You can watch your favorite shows on the HIGH DEFINITION, PLASMA TV. A DVD library is available at Lacey's Place with a wide selection of movies. If you prefer, you can enjoy a cup of hot chocolate as you snuggle in front of the cozy gas fire place. KITCHEN/EATING AREA: The dining table, which seats 6, is perfect for gathering the family for an evening of playing cards, board games, or to work puzzles, all available from our collection. There is also a counter bar with three bar stools. The kitchen is fully furnished with cookware and service for eight. Any cook will appreciate and enjoy the granite counter tops. There is a washer and dryer located in the kitchen area, as well. The cabin has a water filtration/purification system. OUTSIDE/PORCH: The huge wrap around porch offers wonderful views of the mountains. You can enjoy a morning cup of coffee while swinging in the old-fashioned swing under the covered porch. Four rocking chairs are also available so you can watch the morning mist rise from the mountains. The outdoor stainless steel gas grill will impress most any chef, and the family can enjoy dining on the outdoor patio table or picnic table. At the end of a busy day, enjoy relaxing in the secluded hot tub. A rare find, Lacey's Place has a large yard where your pet and children can run and play. The paved drive goes to a level parking area, easily large enough to accommodate three vehicles. LINENS: Lacey's Place offers quality linens, including Egyptian Cotton sheets, plush bedding, and thick oversize towels. Quality location, furnishings, and care all wrapped up in one beautiful, comfortable, cozy cabin - and all this with a spectacular mountain view! Lacey's Place has it all and will truly be your home away from home as you embrace the quiet, peaceful setting and wonderful views that will surround you during your stay. 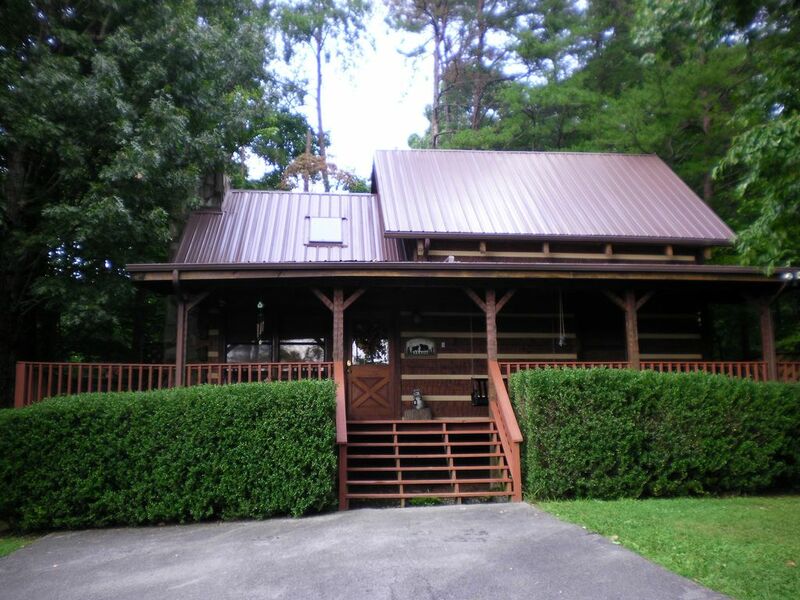 This is a Gatlinburg, dog friendly cabin. We encourage all of our guests (especially our winter guests) to secure travel insurance to protect their vacation investment should the reservation need to be changed or cancelled as we have a strict no refund policy. Travel insurance is available through a number of sources, including VRBO. Our names are Cindy and Steven Mann. We reside in Gardendale, Alabama, a small community north of Birmingham, Alabama. We have 4 children, 2 grandchildren , a Miniature Schnauzer and, a Maltese - Shih Tzu mix. Our cabin is named after Lacey, our first much-loved Schnauzer. We LOVE the Gatlinburg area. We have gone to the Smokies for more years than I care to count :) One year, while vacationing in Gatlinburg, we decided to look at cabins. Our dream has always been to own a cabin in the mountains and when we found this cabin, we knew it was perfect for us. We love the location, and really like the big yard and ample parking. The rest, as they say, is history! Convenience: the location is great! We can be off the mountain and on the Parkway in less than 5 minutes. The area is fabulous and the view breathtaking. Ammenities: Premium 'everything'. We love having all the same ammenties that we have at home, including premium cable tv and free wi-fi Peacefulness: Love the serenity while sitting on the front porch and reflecting on how awesome God is and how blessed we are to be able to behold his abundant masterpiece in creating the Smoky Mountains. A spectacular sunset, beautiful fall colors, a snow covered lawn, brings a constant reminder that God is truly good. Pet Friendly: Dog friendly cabin so you can enjoy vacation with our entire family! toilet, shower, Features a large jetted shower. toilet, combination tub/shower, jetted tub, The tub/shower is in the loft area. Toasts bagels as well as bread. HDTV in Den and both bedrooms. All with DVRs. Premium channels. Large Wrap-Around Porch on Three Sides of Cabin. Porch Swing, Rockers, Patio Furniture, and Picnic Tables. There are 6 steps to get to the front door. A large yard - ideal for children and pets, Paved drive and large paved parking area suitable for three vehicles, A coverd porch with a porch swing, four rocking chairs, and fantastic views of the mountains, Patio furniture and a picnic table for outdoor dining, Private hot tub, Fishing lake within walking distance, A selection of books, board games, card games, and puzzels are provided for the enjoyment of our guests. We had a great time hiking in the smoky mountains. Lacey’s place is great: clean, well stocked, and thoughtful. Beautiful home. Plenty of room for our family of 4 plus a dog. The large lot outside allowed for fun outdoor games after a long hike or day out shopping. The hot tub was clean and ready to go. Also a huge relief after a long day of hiking. Cindy's welcome packet was a wealth of info about the house, things to do for both humans and fur babies, and great places to eat. We definitely recommend this home to anyone looking for a relaxing time in the Smoky's. We'll absolutely be back! Thank you!! We had a wonderful experience at Lacey's Place. Not only was the cabin immaculate and very well-maintained, but it was also located conveniently close to Pigeon Forge and Gatlinburg, and we took a beautiful drive through the national park, also not far. Our cabin was perfect for 5 of us, plenty of accommodations for relaxing, cooking, sleeping (so comfy) and chilling out in the hot tub and in front of the TV and on the wrap-around porch. The mountain views were breathtaking. We can't wait to return! We have stayed in the area numerous times and have found the perfect place to stay it is charming, comfortable and affordable. From the gated porch to all the special touches you feel so welcomed. We come to pigeon forge at least twice a year and this has been by far the best cabin we have been in. Very clean, nicely stocked, loved loved loved the doggie gate on the front porch!! We will definitely be staying here again! * Conveniently located to Gatlinburg, Pigeon Forge, and the Smoky Mountain National Park, all are just minutes away. * A large yard - ideal for children and pets, Paved drive and large paved parking area suitable for three vehicles, A covered porch with a porch swing, four rocking chairs, and fantastic views of the mountains, Patio furniture and a picnic table for outdoor dining, Private hot tub, Fishing lake within walking distance, A selection of books, board games, card games, and puzzles are provided for the enjoyment of our guests. All deposits, reservations and fees are non-refundable. Travel insurance is available as an optional purchase. Pet fees: $50.00, plus tax, per pet, per stay.